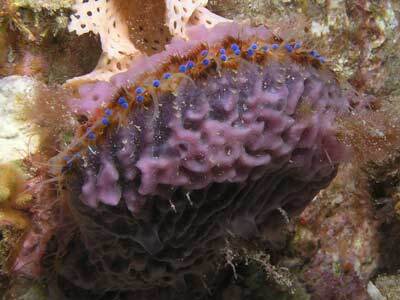 "Bare Island has at least a dozen different dives"
The Northern Coastline of Tasmania is quite spectacular is spots and there are a number of places that you can dive. The Rocky Cape area, located between Stanley and Wynyard, has sites right around the cape as well as further east near Sisters Beach. 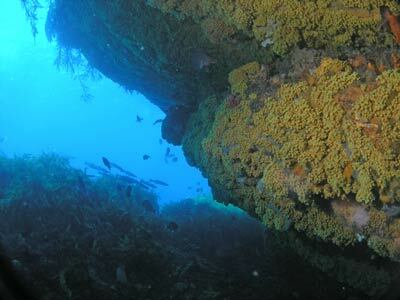 At Rock Cape there are many different dive sites. Most of these are located immediately to the north of Rocky Cape itself. To do this spot, you would normally drive out to Rocky Cape National Park and launch your boat at the small boat ramp here. It is really only suitable for smaller boats (say to five metres) and not all that suitable for a boat like my own Marlin Broadbill except perhaps at high tide (tides on the north coast are large, about three metres here). You could also run from Sisters Beach boat ramp or Boat Harbour boat ramp further to the east. It is a short run from the Rocky Cape ramp to the point. Head north of Rocky Cape to the outer reef. 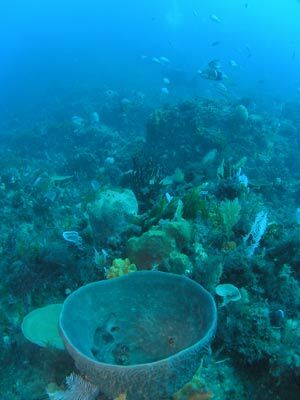 A good spot to dive is at GPS Reading S40° 50' 27.6" E145° 31' 33.2". This is using WGS84, unlike most of my diving GPS Marks on this web site. If you do not know what this means, read my GPS Page. Anyway, it is about 2.4 kilometres to here and the site comes up to about four metres from over 22 metres, so make sure there is not too much of a swell running when close to the bommie. Most diving in Tasmania is not done by anchoring. People seem to either do a live drop or use a small anchor and buoy, dropping divers next to the buoy. The boat then waits for you and picks you up as you surface. I have no idea why this happens, as there does not seem to me to be any advantage overing anchoring like we do in Sydney. Anyway, once at the above location, either anchor or drop your buoy. When you enter the water, if you are close to the bommie you will that it is in fact a double bommie, with twin peaks that come up to about four metres. In between there is a gully that runs north-west to south-east. It is about 10 metres at the bottom. The bommie has a huge amount of kelp, about 1.5 metres high. If you head north-west along the gully, the depth drops to about 22 metres. You can swim in a clockwise or ant-clockwise direction following the sand edge. 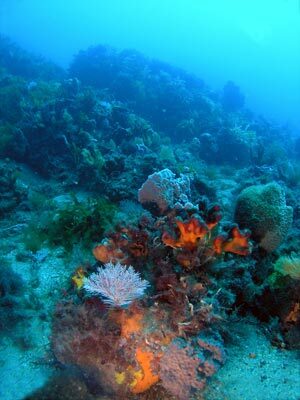 There are lots of gorgonias on the walls and rocks as well as some sponges. On the sand there are yellow and white sea pens, smaller than the ones we normally get in Sydney. 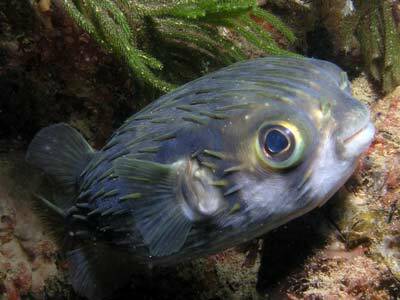 Fishlife seen includes lots of leatherjackets, wrasse, seapike and more. If you head clockwise, the sand edge goes to the north-east as soon as you hit it and then turns rather quickly to the south-east. When you are back about level with the gully between the bommie peaks, the reef heads south-west and then west before going back north-west and north to your starting point. Once your available bottom time starts getting low, head gradually back up the bommie and end up on the top where you can do your safety stop. 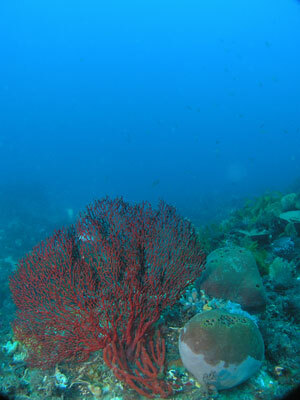 On my dive here in February 2008, we had 18.7ºC and over 25 metre visibility. It really was great! While I did not have any current, there can apparently be medium currents in between high and low tides. On an incoming tide, the current comes from the east. You can dive here with the Wynyard dive shop.